NEW Chicago Blackhawks Book Hitting Shelves This Fall! For all of the old, and new, fans of the Chicago Blackhawks out there, a great new book will be hitting the shelves this fall that will give you insight into the history of the franchise. From the same publishers as “One Goal Achieved: The Story of the 2010 Stanley Cup Champion Chicago Blackhawks” and Bobby Hull’s “The Golden Jet,” Triumph Books is publishing an exciting, new look at the Hawks. 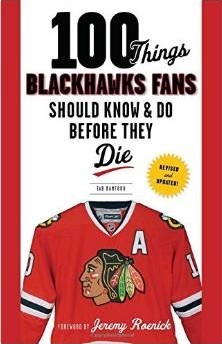 100 Things Blackhawks Fans Should Know and Do Before They Die ranks the greatest players, looks at some of the fun – and strange – stories from the team’s history, and suggests some things every fan of Chicago’s hockey team should do. The book’s forward was handled by Jeremy Roenick. As the release date gets closer, we’ll post additional information about the book. I do trust all the ideas you have presented for your post. They are very convincing and will certainly work. Still, the posts are too quick for novices. May just you please prolong them a little from subsequent time? Thank you for the post.